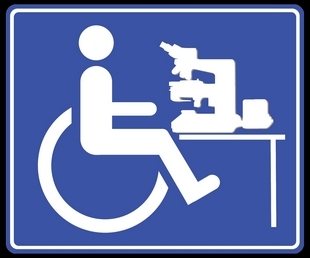 Paraplegia - My Experience: Renovations? Beware!! It was time to replace the windows in our 41 year old house so we shopped around for a contractor. We chose a popular fellow who has a business here in town and has worked on numerous houses in our extended neigbourhood. An established professional in good standing -we had dealt with him previously when we needed new siding. The window replacement included upgrading our heavy wood & glass sliding patio door for something with new bearings that would slide easier. We took great pains to point out to the fellow that this was my secondary wheelchair exit and that It was imperative that I should be able to get through it without restriction. He assured me I would. The old door had a very low threshold allowing me to drive through the door opening with hardly a notice. The new door was installed and right away I noticed a problem. There is a 3 inch (7.5cm) high threshold which now has to be mounted with my wheelchair wheels in order to begin the climb over it. Worse still is the fact that these new light doors are all made from some sort of extruded plastic which seems to delicate to be driven over by a 300 pound chair plus my own weight. 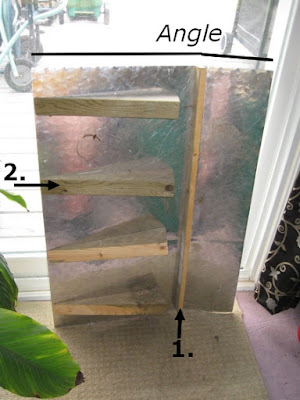 Where my old door's track and mechanism was made of solid wood and a stainless steel runner which was embedded at almost floor level, the new one rises 3 inches above floor level and is framed with flimsy, fragile plastic. What is worse, I am scraping the sides of my armrests as I try to line up and maneuver through the opening. Kinda like threading the needle with a floppy thread - lining the two up takes repeat attempts and patience -not what you want if the house were on fire. The high threshold has something to do with local safety standards. I cannot see what a three inch threshold protects you from - in fact it is a tripping hazard! It certainly won't keep out any floods. 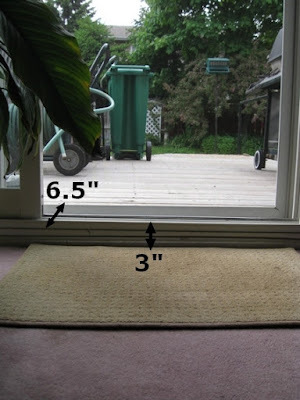 Anyone think of some other safety issue the three inch threshold would protect you from? Yes, the specs show that the doors opening is certainly wide enough for my wheelchair. But that is before you add the safety stops which prevent the door from falling out as well as the door handle which acts somewhat like a bumper, not allowing the door to open to the maximum. Together, these reduce the doors width by over three inches, leaving only 1/2 of an inch on either side for me to squeeze through. So, I've adjusted what I could to maximize the width without having the door fall out of the frame. I will take my time and try not to break the door frame whenever I attempt to use the door. I considered buying commercial ramps to scale the height of the threshold. Some are dense rubber of various 'rise over run' dimensions. They cost about one hundred dollars each and I would need one on either side. While these commercial ramps solve the height issue, I still have a 6 1/2 inch (16 1/2 cm) transition gap between the front of the threshold trim and the rear of the threshold trim. I cannot simply drive across this divide as the plastic is too fragile and would no doubt shatter. 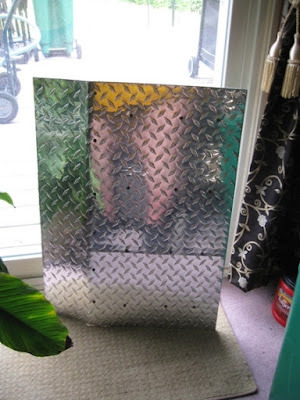 The aluminum runner on which the door glides is also of thin gauge metal and would quickly become bent and misshapen after only a few passes. A helpful neighbour built a small metal ramp which I can lay down to scale the transition. It has a wooden crosspiece which lies in the central plastic channel thereby distributing the weight to protect the sides and bottom. I am grateful for this ramp but it still has to be lined up carefully so that when dropped in, the cross brace enters the plastic channel to distribute the weight evenly. While I am flexible enough to do this myself, it may take several attempts to get it in properly. I then carefully 'thread' my way through hoping not to damage my chair or the door jamb. Once on the other side, I have to pick the ramp up in order to close the door behind me, so as to keep the insects out. Even when you ask the right questions and get assurances, things may not work out as you expect! The Threshold of the new sliding patio doors heading out to my backyard deck. This is my secondary exit from the house in case of a fire. The threshold is about 3 inches high and the width of the door, door frame and trim, all which have to be traversed is about 6.5 inches. The New threshold is made of extruded plastic and an aluminum runner on which the door rolls or glides. Again the overall height is about 3 inches while the width of the opening is about 6 inches. It consists of (1.) the door frame base, (2) the plastic wall (2 pieces) which sandwich (3.) the aluminum runner on which the door rolls or glides. (4.) is the channel through which the front face of the door runs through which I fill with the ramp's cross brace to reinforce against crushing. (5.) 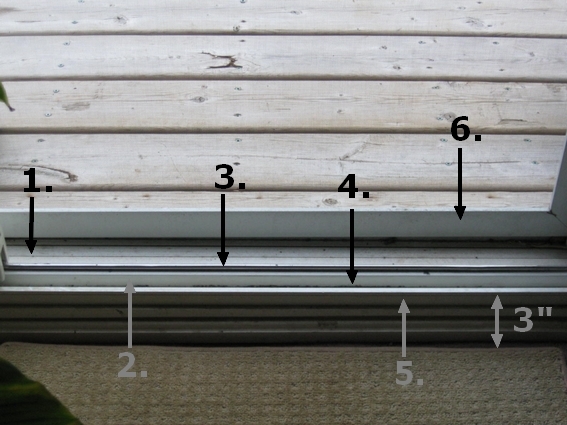 is the outside plastic trim behind which the door face runs as it slides open or closed. (6.) is the screen door which runs on its own, lower track. 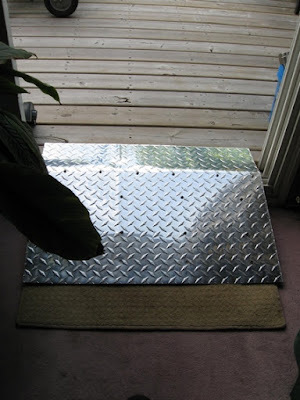 Here is the metal ramp which my neighbour constructed for me. This ramp is standing on end. Here is the reverse side of the ramp showing (1.) the cross brace which drops into the slot through which the door runs through. Without it the plastic may twist or be crushed. (2.) are angled braces which distribute the weight of my wheelchair so that the metal ramp doesn't buckle or bend. The angle is approximate and made to accommodate the transition between the height of my living room floor and that of the exterior deck. A photo of the ramp in place. While it works reasonably well, I do have to make sure the cross brace underneath fills the plastic slot in the threshold perfectly so as not to crush the structure. It does 'toggle' a bit (rock back and forth) as I drive over but not really a problem if prepared for it. I do have to remove the ramp once through so as to keep bugs out. While I can bend down and place/remove the ramp, it is a bit of an effort and annoyance compared to just driving straight through as I used to. 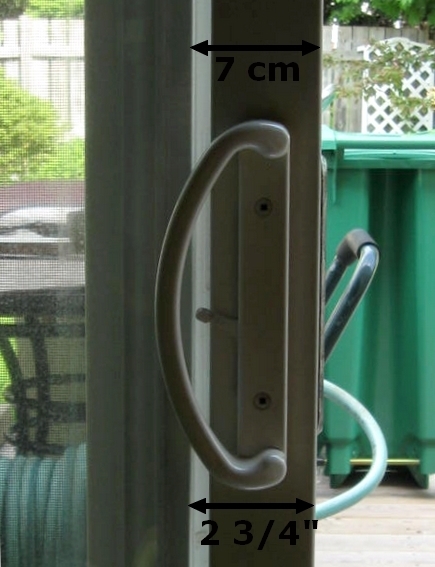 Here is the handle (another handle on back) and the door frame, which, along with the safety stops (not shown) which reduce the actual size of the door opening by about 3 inches (7 centemeters). If I divided the 3 inches in half, I would have an inch and a half per side and adding the half inch clearance per side I currently have, I would have almost two inches per side to drive through with ease.